Current observations of distant supernovae reveal that they are fainter than expected in a Universe with an expansion that is slowing down, or in other words the supernovae seem to be more distant that we expected. The standard explanation of this observation is that the expansion of the Universe has been accelerating rather than slowing down. Theoretically this could happen if the Universe is dominated by a mysterious "dark energy component", which comprises about 70% of the energy density of the Universe. The dark energy component could either be a small cosmological constant (which was originally proposed by Einstein to keep the Universe from expanding) or a time-dependent "quintessence" field. Neither possibility is elegant from the current vantage point of fundamental theory because of unnaturally small numbers needed to fit the data: a fine-tuning to 60 decimal places, and, in the case of quintessence, a tiny mass (smaller than the electron mass divided by 1 followed by 38 zeroes) and almost no couplings to ordinary matter. Because the supernovae observations probe intergalactic distances which are inaccessible to any particle physics experiments, it is natural to consider alternative explanations to the supernova data that do not require cosmological acceleration. We recently considered a model where the dimming of supernovae is based on particle oscillations. Particle oscillations occur whenever one type of particle can quantum mechanically transform into another type of particle. We considered a model with a hypothetical axion (a type of particle that appears in many models of new physics, including string theory). This axion couples to photons (particles of light), which allows a photon to transform into an axion in the presence of a magnetic field. 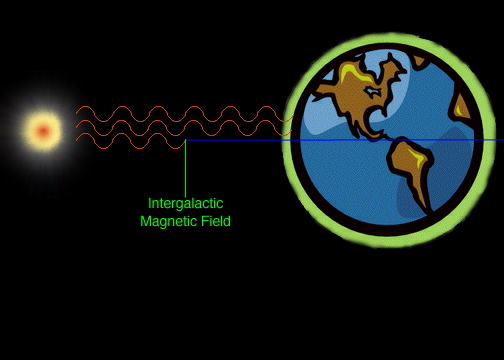 So light traveling in intergalactic magnetic fields can in part turn into axions, and evade detection on Earth. A source would then appear fainter even if the Universe is not accelerating. 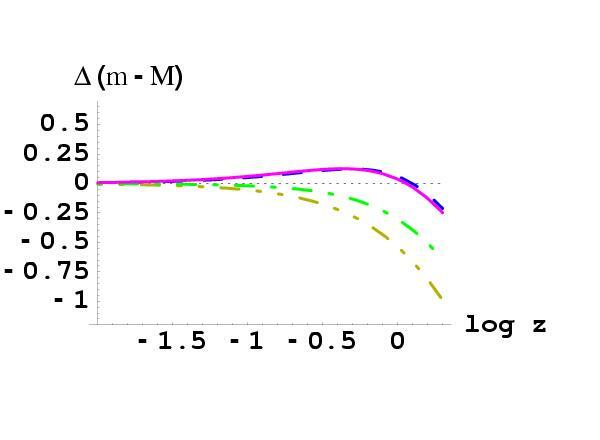 Our calculations show that after traversing large intergalactic distances about 1/3 of the light from supernovae would have been converted to axions. The effect actually saturates at this value, so beyond a certain distance there is no additional dimming, as is actually seen in the supernova data. More recently we have found that axions may play a role in ultra-high energy cosmic rays (also known as trans-GZK cosmic rays). Photons (red lines) streaming from a supernova to Earth. A photon may interact with the intergalactic magnetic field (green line) and turn into an axion (blue line) which cannot be easily detected, and may even pass through the Earth. The magnitude (brightness) versus redshift (distance) curve for several models, relative to the curve for an empty Universe (dotted horizontal line). The dashed curve is a best fit to the supernova data assuming the Universe is accelerating; the dot-dashed line is a Universe with 70% dark energy in the form of a network of cosmic strings with no oscillations, the solid line is the same cosmic string dominated Universe but incorporating our axion oscillation model; and the dot-dot-dashed line is for a matter dominated Universe, with no oscillations. See reference 1 below. Confidence regions for the axion model. 1/M parameterizes the strength of the axion coupling, while w parameterizes the relation of pressure to density of the unknown dark energy. The actual values in our Universe have a 68% probability of lying in the red region. 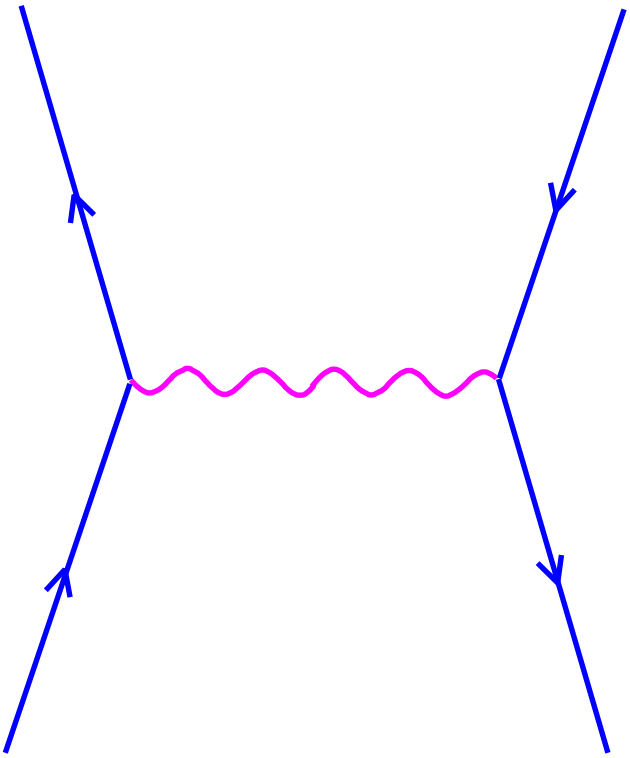 The region to the left of the vertical line corresponds to an accelerating Universe, while the region to the right corresponds to a decelerating Universe. The bottom left hand corner corresponds to the model with a cosmological constant and no axion oscillations. See reference 2 below for more details. The most recent (and thorough) analysis of photon-axion oscillations is by Yong-Seon Song and Wayne Hu (reference 21) who used data from Type IA supernovae, the Wilkinson Microwave Anisotropy Probe, and the baryon oscillations in the density power spectrum seen by Sloan Digital Sky Survey. They find that while photon-axion oscillations cannot explain supernova dimming in the absence of dark energy, photon-axion oscillations with dark energy are preferred by the data over a cosmological constant. 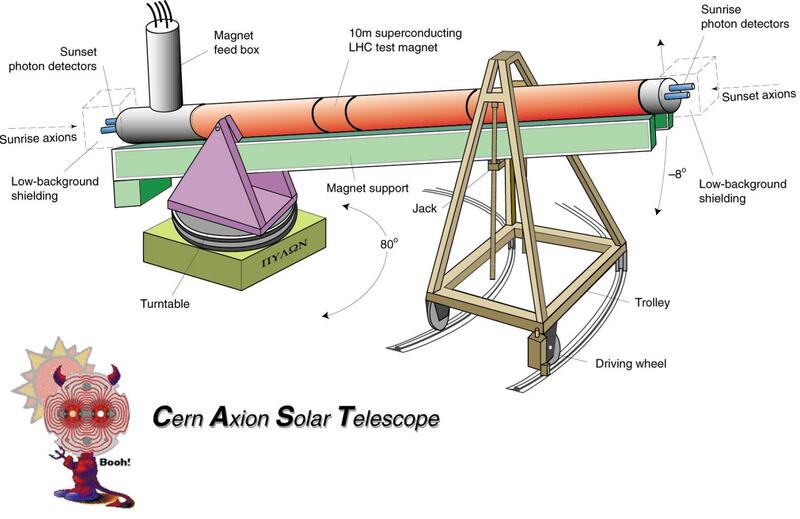 A new axion search just got underway at CERN called the Cern Axion Solar Telescope (CAST). According to their estimates they will be able to probe about half of the available parameter space that could explain the supernova data. After that an astronomy project called DEEP will try to independently determine the rate of expansion of the universe. They claim that they will be able to distinguish between different types of dark energy (i.e. between a cosmological constant which makes the universe accelerate, or something that is less exotic and merely slows down the expansion). A proposed experiment called the Supernova Acceleration Probe would also like to do a more detailed study of supernovae. 1) Dimming Supernovae without Cosmic Acceleration. By Csaba Csaki (Los Alamos), Nemanja Kaloper (Stanford U., Phys. Dept. ), John Terning (Los Alamos). Nov 2001. 10pp. 2) Supernovae as a Probe of Particle Physics and Cosmology. By Joshua Erlich (Los Alamos), Christophe Grojean (SPhT, Saclay). Nov 2001. 17pp. 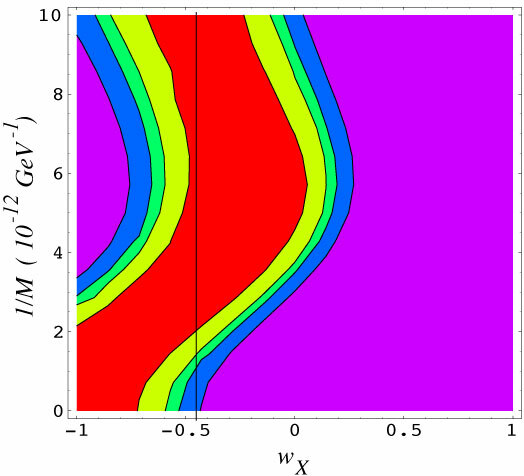 3) Effects of the Intergalactic Plasma on Supernovae Dimming via Photon Axion Oscillations. By Csaba Csaki (Los Alamos & Cornell U., LNS), Nemanja Kaloper (Stanford U., Phys. Dept. ), John Terning (Los Alamos). Dec 2001. 6pp. By E. L. Wright (UCLA). Jan 2002. 4pp. 5) Photon Axion Oscillations and Type IA Supernovae. By Edvard Mortsell, Lars Bergstrom, Ariel Goobar (Stockholm U.). Feb 2002. 5pp. 6) Effects of Initial Axion Production and Photon Axion Oscillation on Type IA Supernova Dimming. By Yuval Grossman, Sourov Roy (Technion), Jure Zupan (Stefan Inst., Ljubljana). Apr 2002. 11pp. 7) Electromagnetic polarization effects due to axion photon mixing. By Pankaj Jain, Sukanta Panda, S. Sarala (Indian Inst. Tech., Kanpur). Jun 2002. 18pp. By Csaba Csaki (Cornell U., LNS), Nemanja Kaloper (UC, Davis), Marco Peloso (Canadian Inst. Theor. Astrophys. ), John Terning (Los Alamos) Feb 2003. 15pp. By Edvard Mortsell, Ariel Goobar (Stockholm U.). Mar 2003. 14pp. By Bruce A. Bassett (Kyoto U. & Portsmouth U., ICG). Nov 2003. 4pp. By Manoj Kaplinghat and Sarah Bridle. Dec 2003. 8pp. 15) Is cosmic distance-duality violated? By Bruce A. Bassett and Martin Kunz. Dec 2003. 5pp. By Jean-Philippe Uzan (Paris, Inst. Astrophys. & Orsay, LPTHE), Nabila Aghanim (Orsay, IAS & Tokyo, Astron. Observ. ), Yannick Mellier (Paris, Inst. Astrophys. & Paris Observ.) May 2004. 7pp. By Csaba Csaki, Nemanja Kaloper, John Terning. Sep 2004. 13pp. By Sudeep Das (Princeton U., Astrophys. Sci. Dept. ), Pankaj Jain (Indian Inst. Tech., Kanpur), John P. Ralston (Kansas U. ), Rajib Saha (Indian Inst. Tech., Kanpur),. Oct 2004. 21pp. By Jarah Evslin (Brussels U. ), Malcolm Fairbairn (Stockholm U.),. Jul 2005. 4pp. By Csaba Csaki (Cornell U., LEPP), Nemanja Kaloper, John Terning (UC, Davis),. Jul 2005. 14pp. By Yong-Seon Song, Wayne Hu (KICP, Chicago and Chicago U., Astron. Astrophys. Ctr.),. Aug 2005. 6pp.